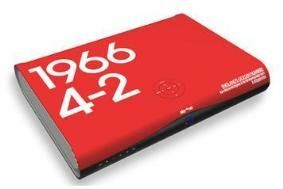 Sky produces three limited edition World Cup HD set-top boxes | What Hi-Fi? Intended to reflect their love of football, and what the World Cup means to them, the three special edition boxes are available to order now for £249 each. Hemingway, co-founder of Red or Dead and Hemingway Design, found inspiration in England's glory year, 1966, using the date and final score from the now legendary game against Germany as the basis of his design. Gerald Scarfe, best known for his work with Pink Floyd, penned his patriotic design in his trademark style. "The sense of excitement, anticipation – and dare I say it, hope – that is growing in England as we approach the World Cup is tremendous. Those emotions fuelled my design – it captures what would be a wonderful moment of English glory and unity," says Scarfe. The third design, by Quadrophenia legend Phil Daniels, was inspired by a working holiday to South Africa back in 1979. "I was out in South Africa filming Zulu Dawn with Burt lancaster and I just remember being visually blown away by the proud display of culture and heritage – such bold, vibrant colours and shapes," says Daniels. "I used those memories as a starting point when designing the World Cup box, and out came a flood of energy, colour and football." To see all three designs in more detail, and vote on which one you like best, see our blog.